Today was Day #7 of Chocolate and Caramel Theme Week. Winter weather makes me want to spend time inside, reading a book, or watching a movie. It's 2013 Academy Award season here in the movie-watching United States. Movies released in November and December will most likely be fresh on Academy voters' minds; and when award winners are unveiled to the public in early 2014. I plan to celebrate the winners with a little chocolate. And, I'll also be focusing on 2013 Chocolate Banquet award nominees. 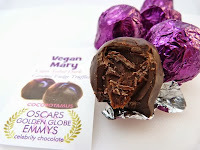 Today's Cocopotamus -Vegan Mary caramel fudge truffles from NYDC Chocolate (Albuquerque, NM) would be a good, vegan movie snack to accompany your popcorn and beverage of choice. 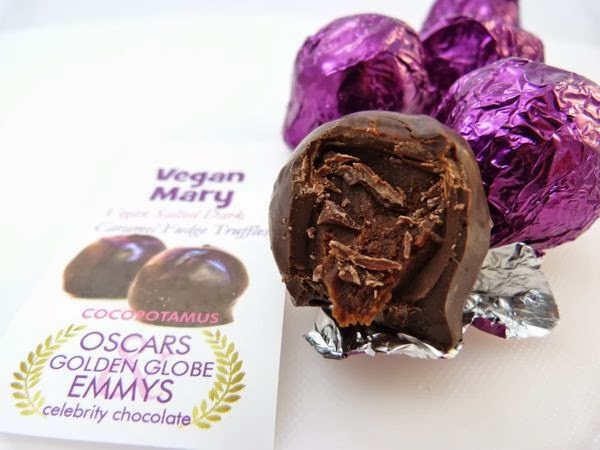 According to the company, Cocopotamus truffles have also been enjoying red carpet status as "celebrity chocolate" at the Oscars, Golden Globes and Emmys. 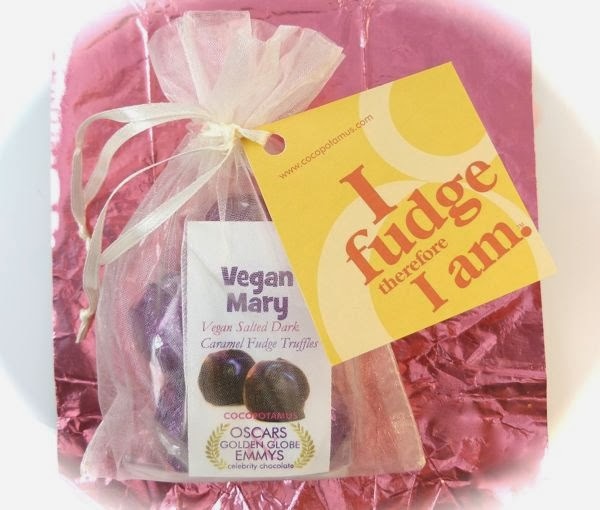 I might nominate these fudge-inspired truffles (packaged in a sheer drawstring bag) to attend movie screenings in my living room -- along with other Cocopotamus "un-caramel"* truffles, and the company's Rosie Posy Mediterranean Rose Water flavored truffles reviewed last month. *No gooey caramel in the traditional sense, they're not your dear grandma's fudge; nor are they your grandpa's caramels. P.S. Did I mention these were vegan and gluten-free?